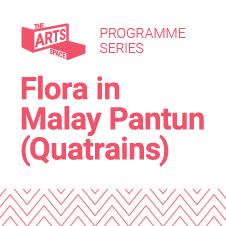 We art both our hearts in need"
Join Malay cultural activist Suhaimi Bin Nasrain as he shares why and how flora metaphors are an inherent part of the art of pantun (quatrains). Discover how they are reflective of Malay culture and thought itself. Suhaimi Nasrain is a civil servant and a Malay cultural activist. For the past 15 years, he has been actively involved in Malay culture, and is an ardent lover of the Malay language, history and culture. Nestled within Level 8 of the National Library is The Arts Space, a cosy corner reimagined to bring our rich arts collection to life. Featuring carefully curated reads, The Arts Space is a place where all are welcome to reflect, explore and create. In this season, explore the beauty of and moments in nature as captured by artists, poets and performers through three trails: Across the Lands, For the Love of Flora and Nature in Abstract.